Clay Collins is a boss. He’s the cofounder of Lead Pages, one of the easiest ways to create name capture pages, landing pages, launch pages, sales pages, and other conversion pages for your business. In other words, it’s a landing page generator (with the highest-converting landing page templates in the business). Since Clay’s one of the owners, he gets to see behind-the-scenes… that means, tens of thousands of landing pages stats. Think about it. Thousands of customers. Think about all that useful data that Clay has access to. In this episode, Clay shares his best tips on making landing pages that do one thing extremely well – get people onto your list. After listening to this podcast, you’ll be slamming names onto your list faster than you can say profit. Is there an inverse relationship between opt-in rates and lead quality? Does more opt-ins mean less quality and vice versa? Speaker 1: This is one of these freaking rants. I feel really strongly about this. Hey podcast listener. You’re about to discover insider tips, tricks and secrets to making more sales and converting more prospects into customers with email marketing. For more information about the email marketing podcast or… Go to themcmethod.com/podcast. Hey everybody, it’s John McIntyre here. 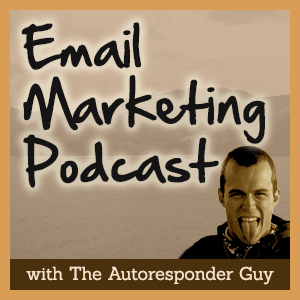 The auto responded to guy and it’s time for episode 12 of the Email Marketing Podcast where we talk about the top tips, tricks and secrets were making more sales and growing your email with marketing and today I’ll be talking to Clay Collins. He is the cofounder of a sweet piece of software called Lead Pages. Lead Pages is a landing page generator which means it generates landing pages. We aren’t talking about emails today, not really. We’re talking about landing pages because listen this is important. Your landing page, it’s the page where people get on to your list. If you do this wrong, you’re not going to end up with anyone on your list and it’s going to be really hard to make any sales. Email marketing is pointless if you don’t have many people on their to send emails to. If you get it right, you’d be laughing laugh your way to the bank. That’s what they say anyway. Since Clay’s the owner or one of the owners of Lead Pages, he has tens of thousands of data points from all the different customers which means scientific growth basically of what works and what doesn’t when it comes to landing pages. By the way, check out a book called “Scientific Advertising” if you’re looking for something to read. It’s required reading for any marketer. About those thousands of data points, in this episode Clay shares lessons from all these data points which is pretty damn cool. To get the… For this episode of the Email Marketing Podcast go to drop dead copy.com/ep12. I’m going to script through our views this week because I want to get on into the interview. If you like what you discover here, leave me your review. You put a smile on my face. You help to get the word out about the podcast and I’ll even read out your review on the podcast so you get famous as well. Go to drop dead copy.com/podcast. Follow the links to do that. One last thing before we get over to play and I’m running out of guests to interview. So I need some ideas. Email me at [email protected] with anyone in the industry who does email, who knows anything about email and you would like to hear from, and also topics. If you want to hear about a specific topic related to email marketing let me know. E-commerce, anything. We’ll go from there. Otherwise, I’m going to have to interview myself and I don’t know what would happen there yet. Enough chitchat, over to Clay Collins. It’s John McIntyre here. The auto respondent guy. I’m here with Clay Collins. Clay is the cofounder of… Builds simple and beautiful software and web apps that… Grow a large and devoted audience and grow your list of leads.… Mission is to take the best and latest of what’s been tested and proven in marketing and just do it for you. Clay how are you doing today? Clay: I’m doing excellent. Thank you so much for having me, John. John: Thanks for coming on. I thought today we talk about… Our landing pages because you’ve been doing the pages and that’s taken off really quickly. I actually just set it up on one of my sites and it’s going really well. It’s getting some great conversions. A lot of the other episodes I’ve talked to the guests about how to write emails and how to tell stories and how to sell, but the landing pages is just as important because that’s how you get people on to the list in the first place. Clay and I were just talking before the call about how we were going to, we just had an off-the-cuff conversation about landing pages and hopefully, it turns into something valuable and actionable that you can use. Let’s start their man. What’s the big picture of a landing page? What do you think about them? Clay: I like them. I think about landing pages like this. It’s an ambiguous term, what is a landing page? To me, I don’t think in terms of landing pages. I think in terms of conversion pages. What are the pages on your website that are generating conversions? What I found in our research is that with most people about 5% of the webpages are generating about 95% of the revenue in business. 5% of the webpages are generating 95% of the growth and the business progress and the revenue. Wouldn’t it be who you to focus on those pages that are the big lovers in your business, as opposed to doing what most people do like writing another blog post or spending more time on social media or doing a whole bunch of other things that might potentially create traction, but won’t necessarily. I’m not saying things like writing another blog post or doing content marketing and things like that are bad, I’m just saying that we found that when you concentrate on those core pages that are actually driving sales and that are actually driving opt in, a little effort can go a long way. I’ll tell you a story from my own life. Back in the day, I knew that we wanted to double our revenue as a business. I started thinking about the various ways that we could do that. The first way that I thought of was that we could double the conversion rate on our sales pages. I tried to do that, but after a while, after about a half an hour looking at my sales, I was like just don’t want to do this. When I write a sales page the first time, I’m done. I’ve already done the design. I’ve written a video. I’ve recorded. I’ve scripted. I just didn’t want to do it. Let’s scratch that one. The next thing I thought of was that we could double our revenue by doubling our traffic to our business properties, to our websites. I started tweaking around with that and like SCO optimizing. We were already pretty SCO optimizing. We were already doing really good in the traffic department. There’s paid me and all things things to do it, but to actually task of doubling our traffic was near impossible. We got it up another 20%, 25% and that was great for us, but doubling was really hard. So I was like scratch that. This isn’t how we’re going to quickly double our business. The next thing I did which ended up working was I systematically went through all the landing pages in our business and I doubled the conversion rate on those pages and in some cases, I tripled or quadrupled the conversion rate on those pages. What happened when I systematically did this. I did it with one of our most important pages at first and that doubled our revenues and it was a business. Then we doubled our revenue just that month. The next month as I systematically did this, we doubled our revenue again so we had quadrupled at that point. Then the next month, we doubled again so we were asked an 8X and we almost got to the next, we almost did this for months in a row. We almost got to a 16X, doubled and then doubled and then doubled and then doubled, but we got somewhere like a 15X. That was all by focusing on converging pages, on opt in pages because the conversion rate on our sales page stayed the same and our traffic stayed the same, but the percentage of people who arrived at our website ended up happening in skyrocketed and then whenever we published a subsequent post, we had more people sharing those and more people tweeting it. It had a profound effect. One of the reasons why I’m such a huge advocate for, I’m just going to call them conversion pages, but like opt in pages or conversion pages, it’s because it’s really is one of those areas unlike traffic getting and unlike writing a huge on page of sales copy, it’s one of those things where you can play around and have a lot of fun and create a great deal of traction in a short period of time. John: One thing that I think is interesting there is it’s reminds me of the power of email marketing and that a lots of people think that they should be going on social media and Facebook and Twitter, when what they need to be doing is capturing emails. If they are capturing emails, then find out how to capture more emails because those leads are the lifeblood of their business. Like you said, you did a 15X by increasing the amount of emails were collected. That’s insane, but that’s what happens will focus on the leads. 2 really good sections in that podcast. Worth it. Thanks so much for having me on your podcast, John! I really enjoyed our conversation. Likewise Clay – I had a blast and think there is some great stuff in there.